KMS February 2017 Newsletter . . . Now Online for Viewing. . . The Kenton Middle School February Newsletter 2017 is online for your reading pleasure. Enjoy! KMS January 2017 Newsletter . . . Now Online for Viewing. . . The Kenton Middle School January Newsletter 2017 is online for your reading pleasure. Enjoy! KMS December 2016 Newsletter . . . Now Online for Viewing. . . The Kenton Middle School December Newsletter 2016 is online for your reading pleasure. Enjoy! KMS Menu for Monday; November 21st and Tuesday; November 22nd. . .
Monday; November 21, 2016 Cooks Choice Tuesday; November 22, 2016 Cooks Choice **Both days will be assorted as Chicken Nuggets, Burgers, Pizza, Hot Dogs, and Fajita’s will be served. Happy Thanksgiving everyone! KMS Thanksgiving Feast provided by UPSTANDERS…..
KMS September and October 2016 Newsletter . . . Now Online for Viewing. . . The Kenton Middle School September and October 2016 Newsletter is online for your reading pleasure. Enjoy! KMS May 2016 Newsletter & Monthly “Crack the Code”. . . Now Online for Viewing. . . The Kenton Middle School May 2016 Newsletter and “Crack the Code” is online for your reading pleasure. Enjoy! 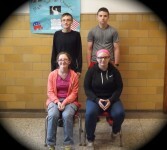 KMS May Students of the Month 2016. . .
KMS UPDATED Menu Change for Week of March 28, 2016. . .
KMS “Cooks Choice” for March 22, 2016 . . .